This paper investigates the mining sector’s poor productivity performance as measured by the growth accounting formula for multifactor productivity (MFP) index during the recent mining boom in Australia. We provide an alternative measure of productivity growth by estimating a translog variable cost function, with parameters that separate productivity growth due to technical change from that due to the effects of returns to scale, capacity utilisation and natural resource inputs. The results show that the average MFP growth in Australian mining based on the dual cost-function measure of technical change is 2 % over the sample period 1974–1975 to 2007–2008, rather than −0.2 % from the published index. The difference arises because declining natural resource inputs, the effects of capacity utilisation and returns to scale have all reduced the ‘true’ MFP growth. We thank two anonymous referees, the Guest Editors and participants at the Asia Pacific Productivity Conference 2010 for helpful comments. All errors and omissions remain the responsibility of the authors. (a) 1985–1986 to 2006–2007, ABS Cat. No. 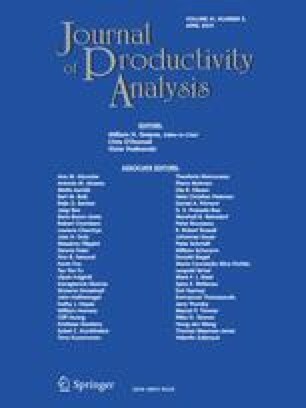 5260.0.55.002 Experimental estimates of industry multifactor productivity, Australia: detailed productivity estimates, Nov 2009.